The Juniata County Trout Club is a 100% volunteer run non-profit organization based in Mifflintown, Pennsylvania. Our primary function is nursery-raising and stocking trout in the streams of Juniata County. We love trout fishing and hope to preserve this sport and pastime for generations to come. For more information visit the links below or fill out the contact form. 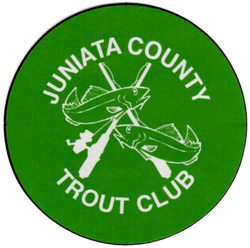 ​what does the juniata county trout club do? Raise Trout:From the Pennsylvania State Fish Commission, The Juniata County Trout Club receives a variety of 7000 fingerling sized Brown, Brook, and Rainbow trout annually. We house them in our 5 pen raceway, which is inspected for water quality two times a year. The raceway is located on Zendt Hollow Road off Cedar Spring Road in Mifflintown, PA. We receive the trout in early July and raise them until stocking in early April of the next year. Our volunteer feeding manager establishes a feed schedule for the trout to be fed two to three times per day during this time until they reach anywhere between 8” and 20” in length. The trout club pays for the feed based on donations from trout fishing enthusiasts, yearly membership button donations, and fundraisers (please see our Nascar Fantasy Race Pool information). The stocking schedule, which is decided at our yearly meeting, is posted publicly at area businesses and on this site. As scheduled in early April, volunteers gather at the nursery and load buckets of trout onto a truck equipped with a specialized hauling tank. Volunteer members are needed at our nursery to net fish out of our trout pens and to carry buckets to the truck. After filling the truck, volunteer members are also needed to convoy with the trout to various streams around Juniata County. At each stop, volunteers carry the buckets of trout to the streams and creeks. We never charge for fish, we simply raise the trout and stock them in the streams of Juniata County for all to enjoy, both members and non-members of The Club alike! As an organization, we never take a dime away from the fish to pay ourselves. We do not even pay our stocking drivers for fuel used during stocking trips; like the rest of our members, our driver’s donate their time, talent, and money simply for the love and enjoyment of fishing and giving others the opportunity to do so! We hope to help preserve this sport and pastime for generations to come. For the past 25+ years, The Juniata County Trout Club has held the Bill Beward Memorial Fishing Derby over Mother's Day weekend for children 12 and under (accompanied by a responsible adult). Last year the Derby hosted about 120 kids along the streams of Licking Creek. Trophies and prizes are given to several age categories throughout the Derby. The Derby originated at Doe Run in Helltown, PA and in the early 2000's, through extensive state approved stream improvement projects, was moved to Licking Creek, PA at Zook’s Dam. The Juniata County Trout Club stocks a 300 yard section of Licking Creek with 900 of its biggest and best fish (up to 17-20") so that kids ages 12 and under have a reserved day and area to learn and enjoy the sport of trout fishing. In addition, the trout club reserves the entire month of May as a children-only fishing period. You can help support the Juniata County Trout Club in many ways. If you are interested in joining or supporting us in any way, please use the information on this website to learn more, contact an elected official, or fill out the contact form and we will contact you! We appreciate the contribution of your time, ability, or monetary donations to help preserve our fishing heritage! If you are interested in becoming a member, all it takes is a suggested donation of $5 for a collectible membership button for a full-year of membership. You can also attend our annual membership meeting at Rocky Acres Camp located in Arch Rock, PA. This year's meeting was held on February 9, 2019. If you were not able to attend the meeting but would still like to become a member, you may also simply show up to one of the stockings on the schedule and ask to purchase a $5 yearly membership with a collectible membership pin. Also you can view the meeting minutes at the bottom of this page. Join our annual Fantasy Nascar Racing Pool! A simple way to support what we do for the community, is participating in our annual Nascar Racing Pool. For a $30 tax-deductible donation to the Juniata County Trout Club, this fundraiser provides great competition for Nascar fans to go head to head with friends and family while also providing an opportunity to win some weekly and year-end prize money! See our Race League page for more details.